Cakes are served in many sizes, flavors, and textures. 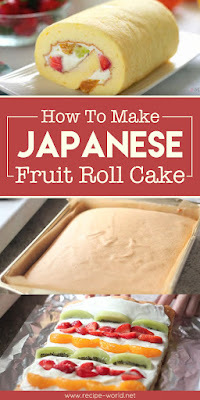 This Japanese version of a fruitcake roll is light, spongy, and creamy. Assorted fruits give a wonderful burst of freshness in every bite. You can add whatever fruits you like to this cake. Place parchment paper over greased baking pan. Add sugar to egg yolks and whisk until sugar is dissolved. Pour milk, oil, and vanilla extract into the mixture. Stir until smooth. Whip the egg whites and salt at the lowest speed for 2 minutes. Add cream of tartar and continue to whip. Gradually add the sugar while whipping the mixture. Once sugar has dissolved, adjust to highest speed and whip for 3 to 4 minutes.